Team Van Oord (TVO) has topped the rankings in an annual sustainability assessment programme carried out by the Environment Agency. With regard to the sourcing of timber, the information provided by TVO was described as ‘the best we have seen on the WEM Framework’. The assessors also acknowledged the role TVO has played in helping Guyana* to achieve PEFC (Programme for the Endorsement of Forest Certification) status for the timber used on Environment Agency construction projects. Phil Ramsay, TVO National Framework Manager, said: “Naturally we are very pleased to have performed well in the Schedule 14 Audit, but we are in no way complacent with regard to sustainability. 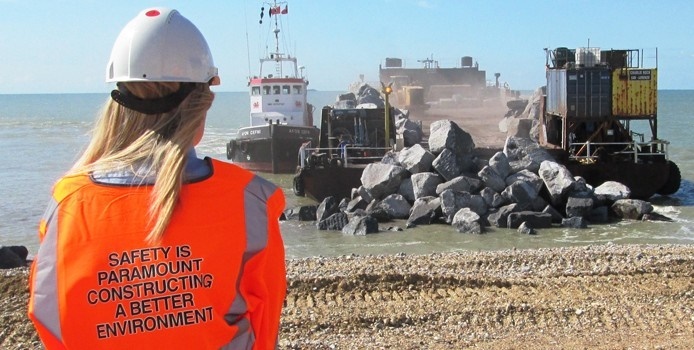 “Our Environment and Sustainability Policy challenges us to manage the sustainability issues arising from our construction projects, which include minimising waste and minimising carbon throughout our supply chain, maximising benefits to local communities and training our staff on environmental and sustainability awareness. “All four TVO partners – Van Oord, Mackley, Kier and Royal HaskoningDHV – have an ISO 14001 accredited Environmental Management System which includes environmental risk assessment procedures for use on site, and the site environmental auditing processes. Guyana is a sovereign state on the northern mainland of South America. It is, however, included in the Caribbean Region due to its strong cultural, historical, and political ties with the Caribbean Community.